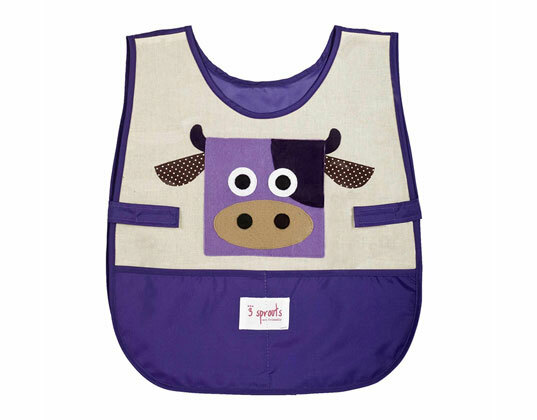 Whether making crafts, creating art projects or cooking, you can keep your tot clean and cute at the same time in an eco-friendly Art Smock from 3 Sprouts (the same company that brings us adorable organic cotton canvas owl storage bins). The one-size-fits-all pullover style is crafted from recycled nylon and eco-spun felt made from water bottles — and it stays put with Velcro side tabs. Kids will love keeping their tools in the front pockets — and even if they’re dripping with paint or batter, you’ll have no problem wiping the smock clean when playtime is over. Whether making crafts, creating art projects or cooking, you can keep your tot clean and cute at the same time in an eco-friendly Art Smock from 3 Sprouts (the same company that brings us adorable organic cotton canvas owl storage bins). The one-size-fits-all pullover style is crafted from recycled nylon and eco-spun felt made from water bottles -- and it stays put with Velcro side tabs. Kids will love keeping their tools in the front pockets -- and even if they're dripping with paint or batter, you'll have no problem wiping the smock clean when playtime is over.